Web application aimed at the reservation of university spaces and resources developed to measure for the Rovira i Virgili University of Tarragona. The purpose of the application is to unify the management of all the spaces, classrooms, materials and resources that the university places at the disposal of its students and professors. 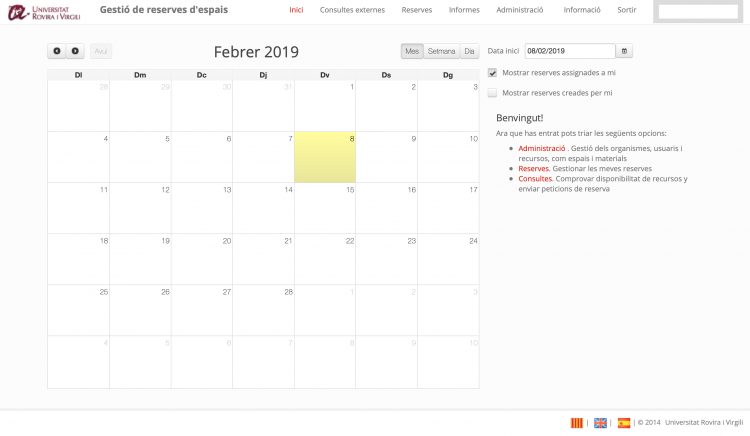 Reservations are made online and affect all campus, extensions and administrative buildings that the client has dispersed throughout the province of Tarragona. Special care has been taken when integrating this application into an external system responsible for managing the teachers and classrooms that are occupied during the academic year.